NETWORK FINALS: The MAYWEATHER/MCGREGOR PRELIMS special on FOX fell 0.2 in final numbers to 0.9, and CBS’s NFL PRESEASON game lost 0.1 to 0.5. Elsewhere, sports preemptions caused major adjustments, as the reruns on ABC fell a respective 0.5/0.4/0.3 to triple 0.4s, NBC’s shows were down 0.3/0.2 to 0.7/0.5, and FOX’s BEAT SHAZAM rerun was down 0.1 to 0.5. 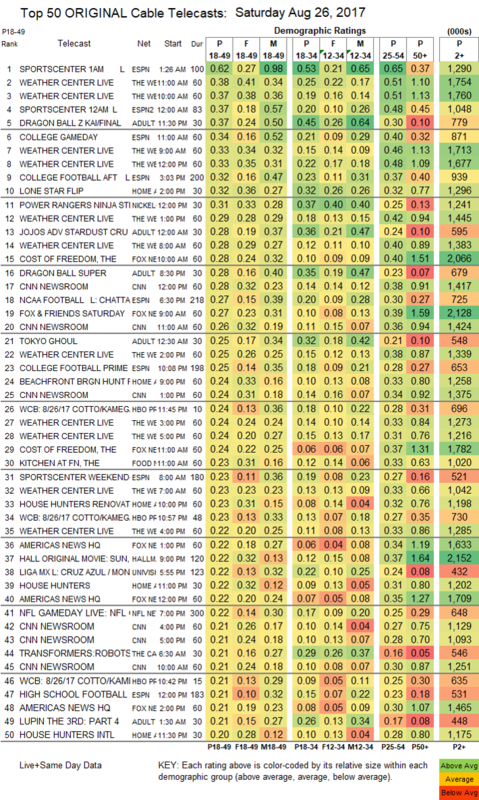 CABLE HIGHLIGHTS: It was a curious Saturday night on cable, as the top-rated show of the night was the installment of ESPN’s SPORTSCENTER (at 0.62) that ran after the Mayweather vs. McGregor bout ended. The Top 10 was otherwise dominated by Hurricane Harvey updates on Weather Channel’s WEATHER CENTER LIVE, topped by the 11AM hour at 0.38. Adult Swim’s line-up was a bit different, with two primetime episodes of DRAGON BALL at 0.22/557K & 0.28 (last week’s single primetime episode was at 0.37), then two more episodes in late-night at 0.39/825K & 0.37 (last week’s single episode was at 0.41), followed by JOJO’S BIZARRE ADVENTURE down 0.07 to 0.28, TOKYO GHOUL down 0.07 to 0.25, HUNTER X HUNTER down 0.05 to 0.24/524K, LUPIN THE 3RD down 0.03 to 0.21/448K, NARUTO down 0.01 to 0.23/510K, OUTLAW STAR up 0.01 to 0.22/463K, ATTACK ON TITAN up 0.03 to 0.22/451K, and SAMURAI JACK up 0.02 to 0.22/420K. HGTV’s afternoon LONE STAR FLIP was at 0.32, while in primetime, BEACHFRONT BARGAIN HUNT held at 0.24, HOUSE HUNTERS RENOVATION dropped 0.04 to 0.23, HOUSE HUNTERS was down a tenth to 0.22, and HOUSE HUNTERS INTL was at 0.20. Nickelodeon’s noon POWER RANGERS rose 0.03 to 0.31. On Food Network, KITCHEN AT FN fell 0.05 to 0.23, and TRISHA’S SOUTHERN KITCHEN was down 0.06 to 0.19. Hallmark’s original movie SUN, SAND & ROMANCE was at 0.22. AMC’s HALT & CATCH FIRE ticked down to 0.10.